From trickles of water to roaring flood-stage torrents, waterfalls are an ever-changing photographic subject. Their structure changes slowly over time, but the water falls differently every second. If one took 10 photographs in a row of the same waterfall, each would look different. Below is an image taken of a small creek. This small area is isolated by using a telephoto lens, then cropping top/bottom of the image, to create an expansive feeling to the photograph. The motion of the water is in-focus. To accomplish this, the shutter speed needs to be at 1/60 second or faster. It is dependent on the speed the water is flowing. With an image like this, it is best to use a tripod to stabilize the camera and be selective about composition. This was taken on a sunny day, and this portion of the creek was in the shade. TIP – When using a tripod, remember to turn-off the image stabilization on the lens. This is a small portion of a stream cascading down and over rocks. Waterfalls come in all shapes and sizes. What makes each unique is the way the water has sculpted the rocks surrounding it. The image above was a small section of a creek. The image below is much larger, and the first falls above a gorge that ends in a 50 +/- foot waterfall. This was a foggy and over-cast day in Mount Rainier National Park. The water in this image is not crisp, yet the rocks are sharp. To get this effect, the shutter speed needs to be 1/8 second or slightly slower. With these shutter speeds, the camera needs to be stabilized on a tripod or other method of stabilization. The aperture was F22, which created a larger depth of field, in comparison to the image above. TIP – When a tripod is unavailable, try using a rock, tree or other object in the environment to stabilize the camera and/or one’s self. This waterfall was just above a small gorge that ended in a larger falls. It is in Mount Rainier National Park. Time of year plays a part in capturing great waterfall images. The photos above were taken during the summer months. The image below was taken in the fall. The leaves have fallen from the trees, and offer a full view of the Whatcom Falls. The ground is covered with autumn colored leaves, adding color to the forest floor. This was taken on an over-cast day in October. 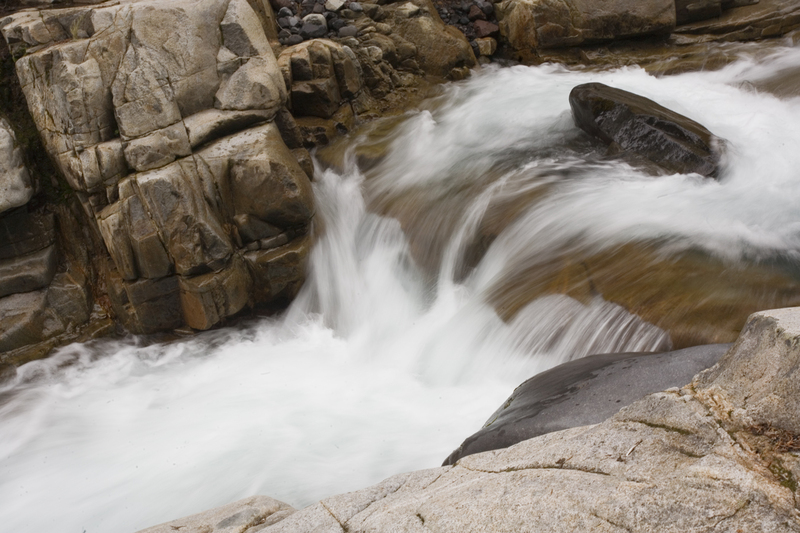 The “milking” effect of the waterfall is due to a slow shutter speed. In this case, it was 1/5 second, and a bridge rail was used for camera stabilization. This was shot with a wide-angle lens, and the aperture was F10. 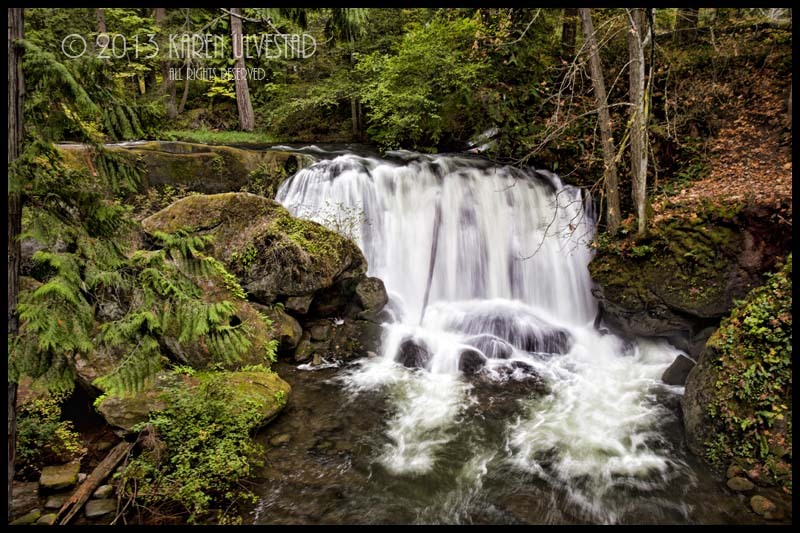 This was taken in the fall, and is a wide-angle shot of Lower Whatcom Falls. This last image is Snoqualmie Falls at flood stage. The roads to the waterfall had been open a couple of hours earlier. It was flowing at 78,000 cubic feet of water per second, and it was incredibly loud. This was taken with slide film, and scanned to digital. These locations are great to photograph waterfalls. It takes some planning to capture the photographic image one is seeking. The things to consider are weather, time of year, equipment, and accessibility to the location. In addition, it is good to factor in the costs associated with travel, food and/or lodging. For more tips and instruction, consider contacting me for workshop information. 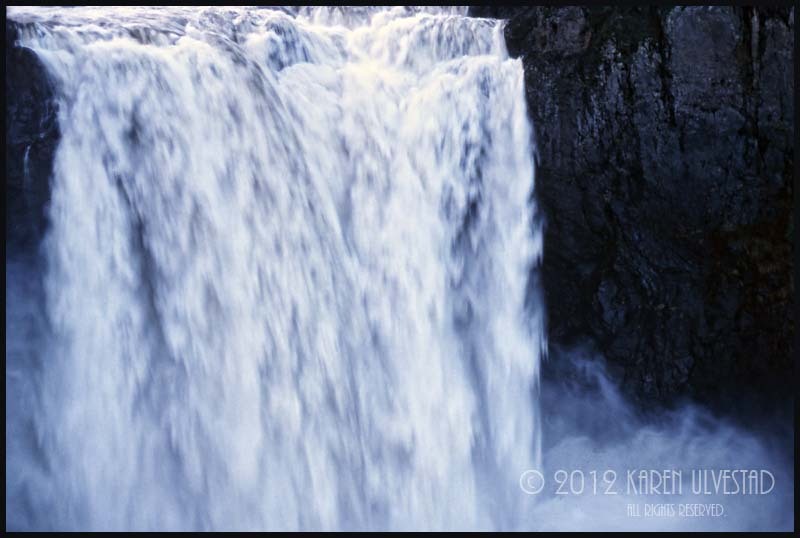 This is Snoqualmie Falls with 78,000 cubic feet of water per second. The road to the falls had opened earlier in the day. Yet another wonderfully written and photographed article! I too use whatever is at hand as a makeshift tripod, including positioning my body to use as such. Photography truely is a medium that requires creativity. Thank you. . .